Tomorrow, this blog joins Project 2996 with memorials to two men who died in the Towers. 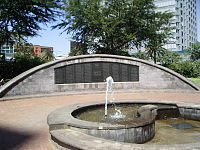 When I went to Kenya last month, we stopped by the memorial to those who died on August 7, 1998 in the bombing of the American Embassy in Nairobi. 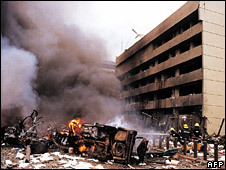 The near-simultaneous bombing attacks on the US Embassies in Nairobi, Kenya and Dar es Salaam, Tanzania took place on 7 August 1998. In Nairobi, where the US Embassy was located in a congested downtown area, the attack killed 291 persons and wounded about 5,000. The bombing in Dar es Salaam killed 10 persons and wounded 77. Read the rest here. Now the American embassy in Nairobi is in a suburban area with a number of other embassies and a lot of security. On the plane from London to Nairobi, I met a man who works at the American Embassy. I asked if there are still problems with extremists and he said incidents crop up from time to time, but are quickly contained. Last summer, I was invited to the Norman Mailer Center in Provincetown. I was very fortunate to take Chuck Strozier’s workshop on Historical Narrative. Among an astonishing number of other activities, Chuck has a blog, is the director of the The Center on Terrorism and has a new book out, Until the Fires Stopped Burning: 9/11 and New York City in the Words and Experiences of Survivors and Witnesses. As Robert Lifton noted, “This is the only work on 9/11 to describe people’s experiences in depth while at the same time providing a broad sense of the human impact of the whole event.” It’s a very absorbing book, so please take a look. ← Is your writing grounded?